MULTIFUNCTION WEIGHT INDICATORS "DFW XP"
The “alibi memory” and “setpoint” functions are available in combination with the required operating mode and they are activated automatically when installing the relevant optional board. 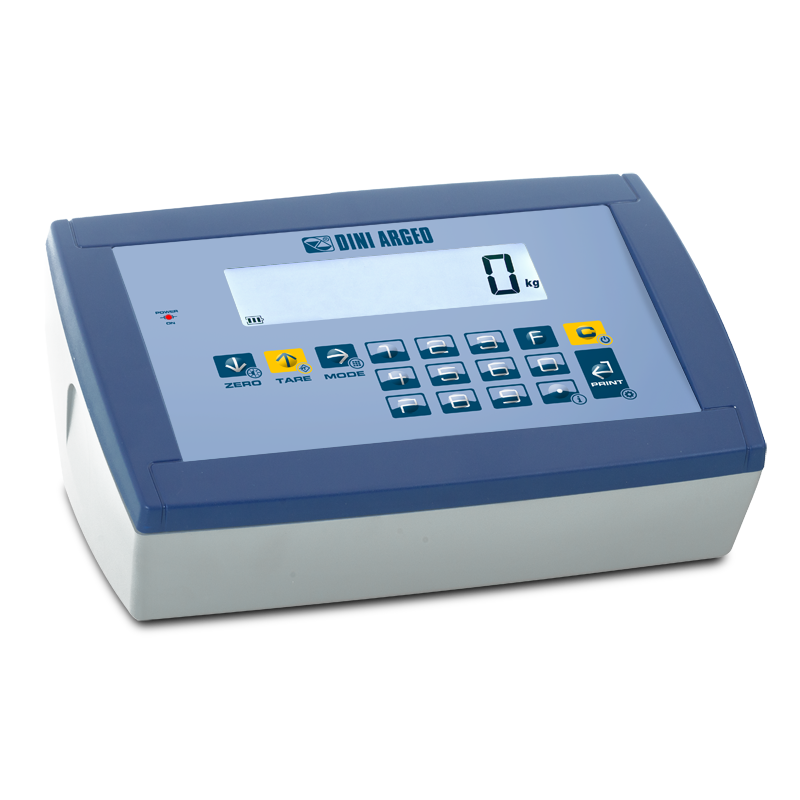 Access to the user menu is gained using the dedicated key* to adjust the weighing filter, date and time, setpoint and tare weight, which the user can access by entering a programmable access password. * These quick access keys to the menus can be blocked by configuring a dedicated password. Infrared 19-key remote control: zero, tare / manual tare, enable / disable function, print, switch-off (IR input only available for models with simplified 5-key keypad). New version of DFWXP weight indicators with completely renewed weighing program and keyboard. The wide range of operating modes and the available interfaces make it perfect for many industrial and commercial weighing applications. It can be used as scales and platforms on the ground, mobile scales etc. Type-approved CE-M(OIML R-76/EN45501). 5-key functional or 17-key numerical and functional waterproof keypad, with indication for quick access to main functions and regulations. The "...PXP..." versions are provided with attached thermal printer and real time clock. Up to 10.000e or multirange 2 x 3000e @ 0,3 µV/d in CE-M approved version for legal for trade use. Digital calibration and set-up through keyboard or PC with DINITOOLS. Connectable with up to 8 350-Ohm load cells or up to 16 700-Ohm load cells. RS232/C (or optionally RS485) bi-directional port configurable for PC, PLC, remote display, and radio modem. Quick RJ RS232 plug connection. IR input only available for models with simplified 5-key keypad. Zeroing, Automatic tare, Presettable tare, printing and/or data transmission, selectable function command, on/off switching, backlit setting, function mode quick selection, user menu. 17-key Version: Database of 30 tares, 2 Numeric IDs, keyboard lock, repetition of last printout made, quick target insertion, APW, threshold and setpoint. Specific program (MSTSLV code) for use of the indicator as a universal weight repeater or as a multi-scale repeater (MASTER) in combination with DFW/DGT/MCW. function which allows to repeat up to 32 independent scales, with the possibility of managing their functions, or displaying and printing the sum of the weighs of all the scales. function which allows to repeat the weight of any scales, through the configuration of the input string. DFWPXP Multifunction indicator 5-key keypad with attached thermal printer backlit LCD display, real time clock and standard weighing programme. DFWKXP 17-key indicator. 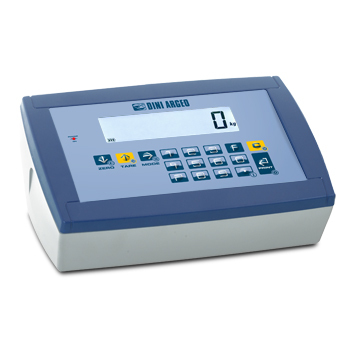 IP65 ABS case, backlit LCD display, and standard weighing programme. DFW-1 5-key indicator with external power supply. Without built-in rechargeable battery, RJ45 connector, glands and caps not included. TAKE NOTE: no option installed at time of order. Options can be provided separately. DFW4CH (S1) Internal board for a quick connection of up to 4 (equalised) scales. WEITRUCK-1 PC software for vehicle weighing. Combinable with DFW, DGT and 3590 series' weight indicators. 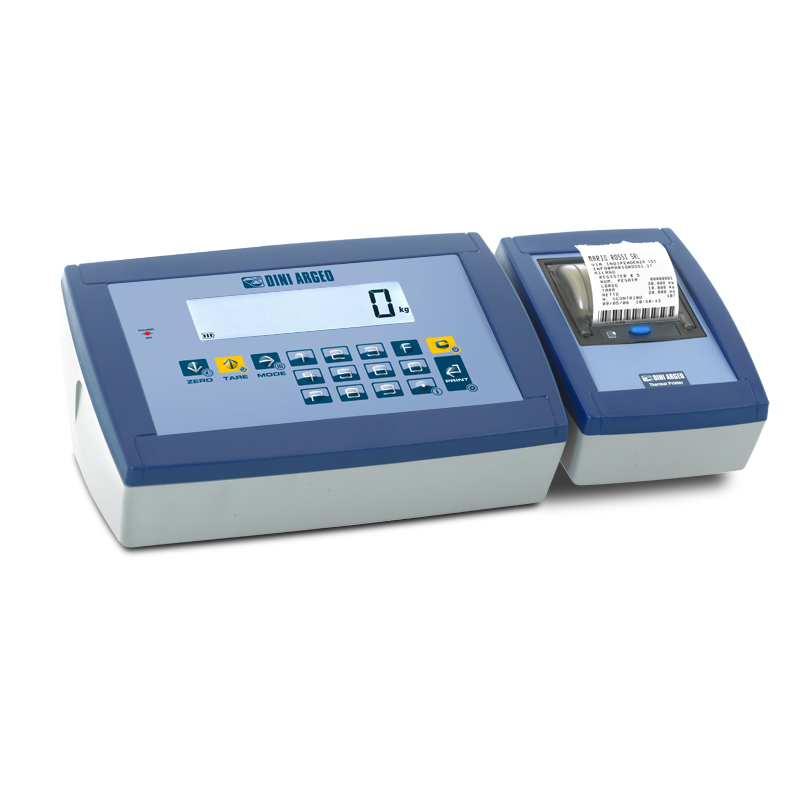 Databases for storing the customer, material, and vehicle data, management of the totals and programmable printouts. Requires an Alibi Memory. CNFSERV Custom-made printouts for DFW and DFWL series. NET price. DF485 (S1) RS485 bidirectional port for DFW series. CVRXP Kit of 10 moulded protective covers in transparent plastic. For indicator DFWXP or 3590EXP with ABS case. DFTL12-1 (S1) 19-keys remote control and infrared receiver kit (max 8m). IR8M Infrared input for IR remote control.